This is Milky. Milky and his brother Snowy were rescued by a kind-hearted woman, Ms. Lee, from Cheonan (about 80 km south of Seoul) after she witnessed Milky jump out from a boiling pot. Here is the link to their story plus updates on Milky’s recovery and here is another petition you can sign to put pressure on the Korean Government to put a stop to animal cruelty. In other news, a man identified as ‘Mr. A’ has been arrested in Busan for violating the Animal Protection Act. ‘Mr. 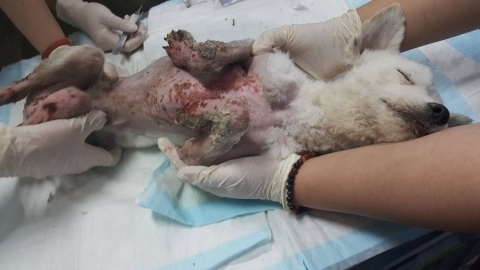 A.’ is accused of boiling alive over 600 stray cats. More information and a petition can be found regarding the incident here. In both instances, what happened to these animals was awful but we would like to point out that in the case of ‘Mr. A.’ this represents one of the first times someone has actually been reported and arrested for acts of animal cruelty in Korea. We are noticing shifts in the attitudes of the Korean people toward the slaughter of dogs and cats and we want to encourage our IAKA followers to support them as they effect real change inside their country. It is because of activists like Ms. Lee, and the unnamed persons who reported ‘Mr. A.’ and Nami Kim, working on the ground in Korea that we see some progress being made. So please, sign petitions, write letters, and encourage boycotts of Korean products but don’t forget to support the people in Korea making a difference right now. Read their blogs, donate to the veterinarians, and let them know that they’re work is appreciated by more than just the four-legged friends they rescue.